In addition, the adapter works well for refractor telescopes when in use for either prime-focus or telescope eyepiece-projection photography. Dual design allows the user to make slight magnification adjustments without having to change telescope eyepieces. 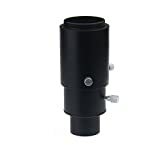 Compatible for both reflector and refractor telescopes with 1.25″ eyepiece holders. The 1.25″ Variable Universal Camera Adapter is made of black-anodized aluminum. 1.25 Inch Adjustable camera adapter lets you attach a T-ring equipped DSLR or SLR camera directly to your telescope. Slides into 1.25″ telescope focuser or 2″ focuser with step-down adapter; has T-threads for attachment of camera body. Allows you to vary the magnification by simply changing the position of your camera. Suitable for eyepiece projection with an eyepiece smaller than 37mm in diameter. Made of high grade alloy, not plastics. This entry was posted in Astronomy Products and tagged 1.25, Adapter, Adapter1.25, camera, Eyepiece, Focus, Inch, photography, prime, Projection, Solomark, Standard, Telescope, Variable by Celestial World. Bookmark the permalink.